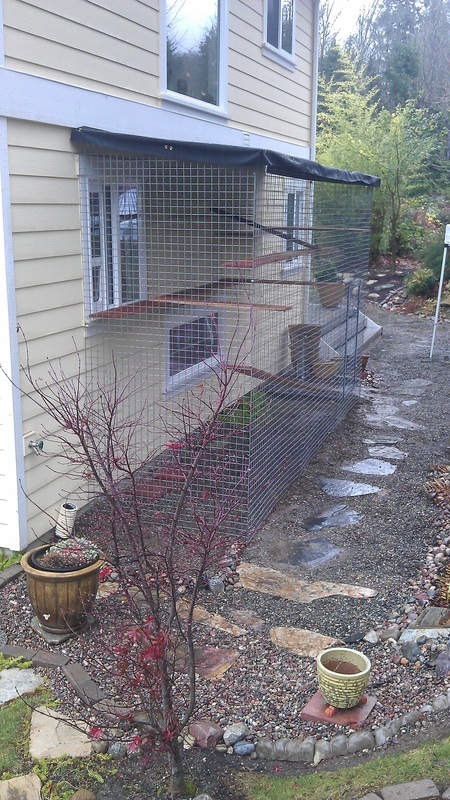 Pet Enclosures Northwest builds custom pet enclosures for cats and dogs. Not wimpy little cages made of chicken wire, but durable, high-end, maintenance-free enclosures where your pet can experience the great outdoors year-round. We produce the most secure outdoor habitats available. Pet Enclosures Northwest creates an environment that your pet will enjoy, where your pet can have fun watching the birdies, smell the roses, relax or snooze breathing the fresh air. If your pet is bored stiff and needs that extra room outdoors free from the dangers of itinerant wildlife look no further: we have a solution for you! Our enclosures are suitable for both cats and dogs (possibly your bunny or other pet, too). Every enclosure is custom-designed and custom-made to fit into your environment: We design pet enclosures for houses, apartments or condos: in your back yard, on your deck, on your balcony, along your garden wall, or in your window. Together with you we will design that perfect enclosure for your pet, construct the parts and install your pet's new play pen at your home. Call us at 425.786.1221 to arrange for a consultation.